Elizabeth Karmel and me outside our Mecca. 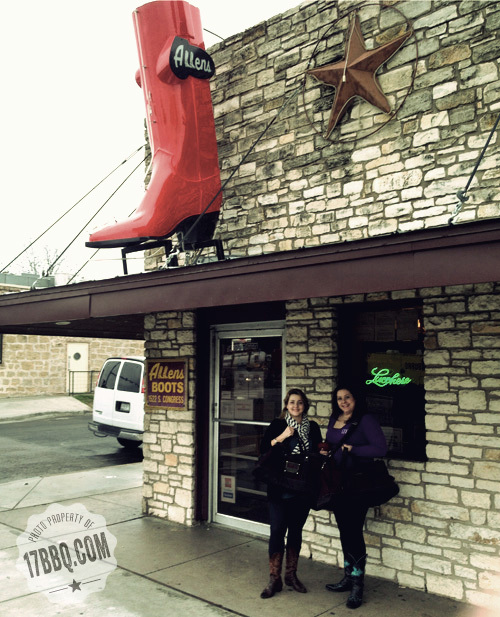 No trip to Austin is complete without a pilgrimage to Allens Boots, the premiere resource for cowboy boots and fashionable western apparel. 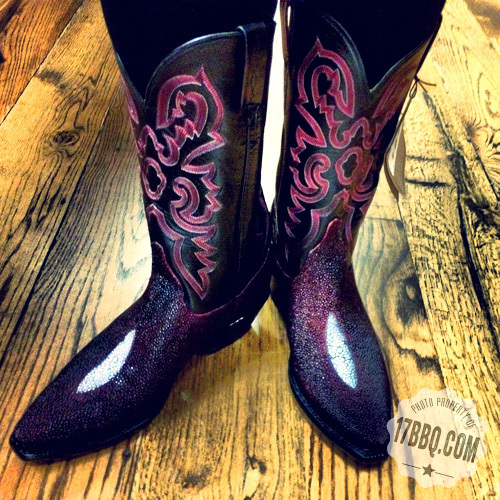 Their huge selection of Lucchese and Old Gringo boots is unparalleled. I prefer men’s Luccheses as they fit me best. And hidden in plain sight, on a higher shelf in the men’s department, were these stingray beauties. They were custom made for a man who never picked them up. And now they are mine. Allens has continually updated shopping site where you can shop by brand, size, etc. And if you make your way there in person, ask for Ryan or Rebecca. They are both extremely helpful and knowledgeable. Tell them I sent you! We didn’t have much time for other shopping this time around, but we did pop into Uncommon Objects, a large antique emporium in which you can get lost for hours, and Heritage Boots, another fine boot purveyor. Both are highly recommended stops. Read more about my Austin trip: Part 1 and Part 2.